Ætherverse: Upheaval. 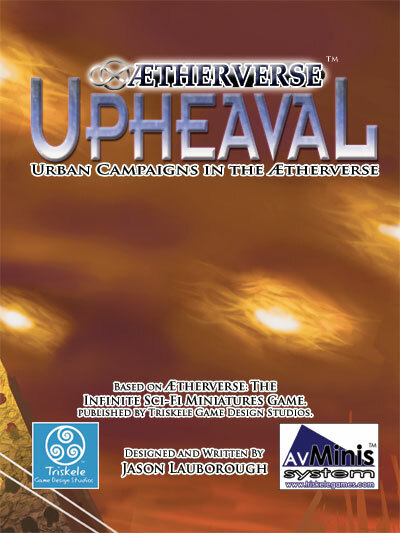 Upheaval is a new, fast-paced game of small skirmish combat, set in the cities of the parallel universes of Ætherverse. Upheaval features an exciting campaign system, giving players new strategic choices as they guide a band of green troops through battle after battle, guiding their experiences and upgrading their abilities and equipment until they either become an elite force or are destroyed and replaced by new green troops. 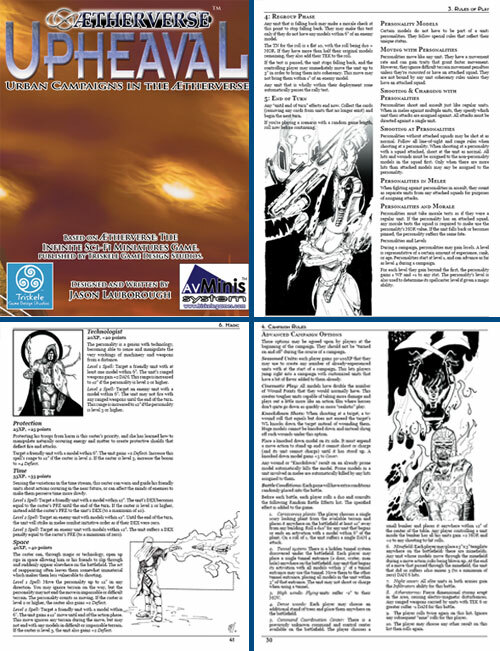 Available exclusively in digital download format, Upheaval is a 48-page PDF written by Jason Lauborough, designer of the original Ætherverse and featuring art and fiction from the Ætherverse print rulebook. The game leverages aspects of the revolutionary Ætherverse army design system to provide a highly flexible upgrade path for units as they progress through the game. The gameplay portion of Upheaval features a revised and pared-down version of the Ætherverse rules, optimized for small-skirmish play between two to four small units of troops (roughly 8-30 models per army). Upheaval is suitable for sci-fi play of military or "gang warfare" variety, historical and modern skirmishes, and fantasy warband campaigning. The PDF also contains options for adding even more detail to your campaigns, as well as providing rules for creating units that are already experienced, allowing for "one-off" games to be played between interesting armies without having to go through a full campaign system. Upheaval's gameplay rules are ideal for 2-4 players, and the campaign system supports as many players as desired. Upheaval is fully supported by the Triskelegames.com website, including an active forum community, and will receive periodic free updates through the release of the semi-monthly Æthergate Newsletter. Richard Smith 9 9 9 A very nice set of skirmish rules with a very solid system! Well worth the money and the only down side to the game I have is that there are no vehicle rules, otherwise its excellent! Jim Gross 10 9 10 The concept is great. The rules are understandable. I am now in the process of setting up my first game. I like the download idea as I can get my game fast and inexpensive.